Chiwda or pohe is beaten rice (after parboiling it to some extent, hence probiotic) and dahi is cultured yogurt. Chiwda dahi or dahi chiwda as it is called in eastern Uttar Pradesh and Bihar, is a very interesting easy breakfast that the rural folks still have. But it is a largely forgotten breakfast for the urban world, what with a flood of all kinds of cereals packaged in attractive boxes, claiming several health benefits. Honestly speaking, we did not have this very often at home, but a winter harvest festival (makar sankranti) was a time when this dahi chiwda was made with a lot of fuss, and enjoyed thoroughly. 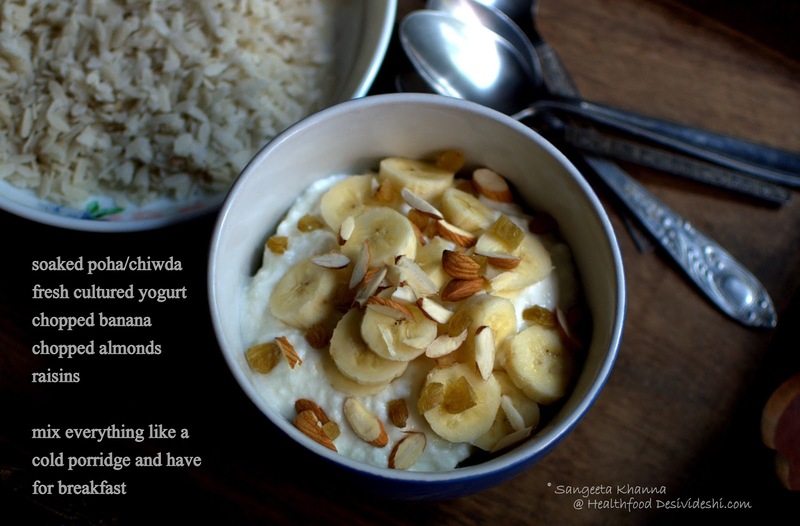 I remember my grandmother would set yogurt with great difficulty during the chilly winters with added saffron and nuts and the yogurt will be mixed with some more fresh cream in the morning to be further mixed with soaked chiwda (beaten rice). I still remember the melt in the mouth fragrant dahi chiwda of those days which was very lightly sweetened with raw sugar. It was not a regular breakfast at my place but I saw Arvind was quite used to it and would ask for it every once in a while. It so happened that my MIL would give both his sons this easy breakfast quite often as she had a lot of chores to handle along with a job. Later I also started liking the plain yogurt dahi chiwda as well, the saffron infused yogurt that my grandmother and mother used to make for makar sankranti is made only occasionally now, not that it was frequent back then. 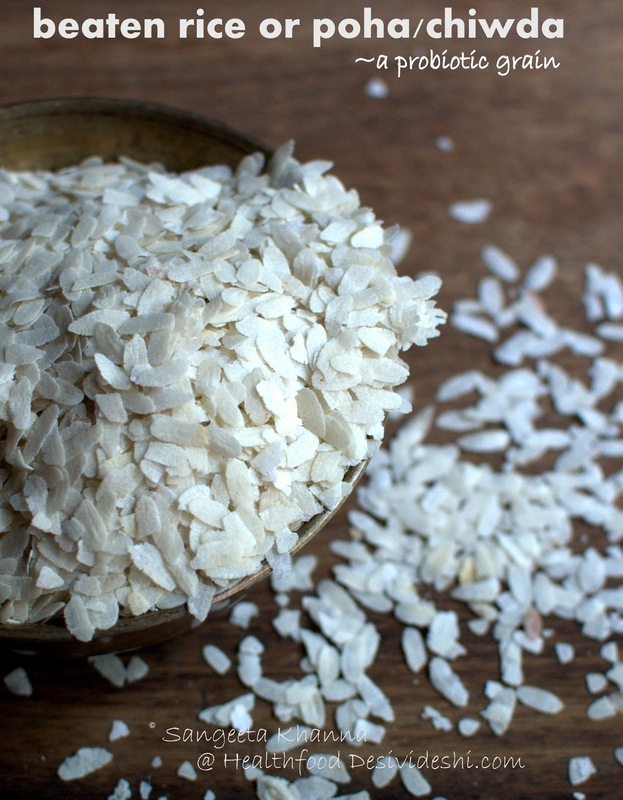 Poha or chiwda is a probiotic grain and it is very light on the system. I use it in smoothies and a savory poha recipes as well. Here is how a brown poha looks like. To make the dahi chiwda, the poha is rinsed in a colander using filtered water. Leave the rinsed and drained poha for about 5 minutes and then mix it with fresh yogurt, fruits and nuts. Banana is a common 'add on' to dahi chiwda but mangoes make a very nice variation during mango season. 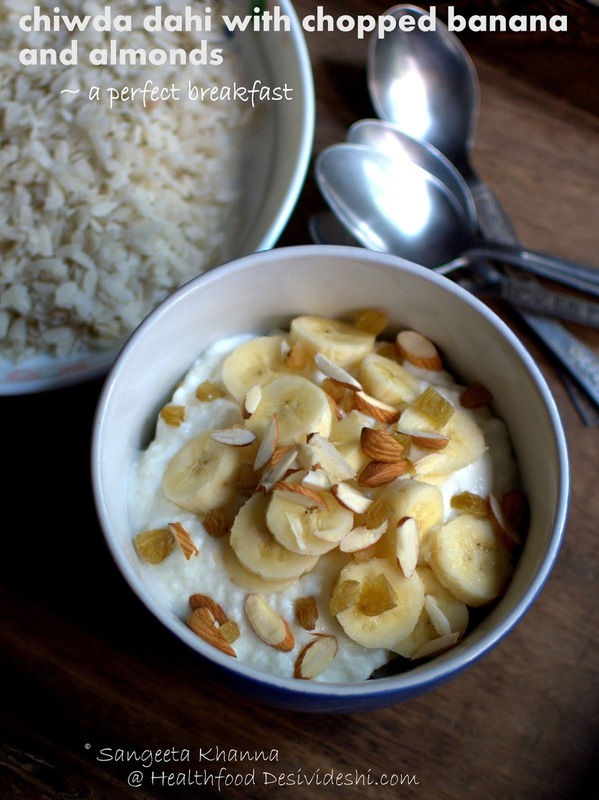 Add almonds and other nuts to fortify some protein as well as some crunch to the dahi chiwda. I do not add any sugar to it so a few chopped dates or raisins also go into it. Dahi chiwda is best served cold or chilled if you like. It is a frequent breakfast for the husband, he sometimes likes it with honey. Do try once if you haven't already tasted this wonderfully simple and tasty breakfast cereal. I say some traditional indigenous foods are also 'fast', 'instant' and yet so healthy. I was talking about the food wealth of India last time. 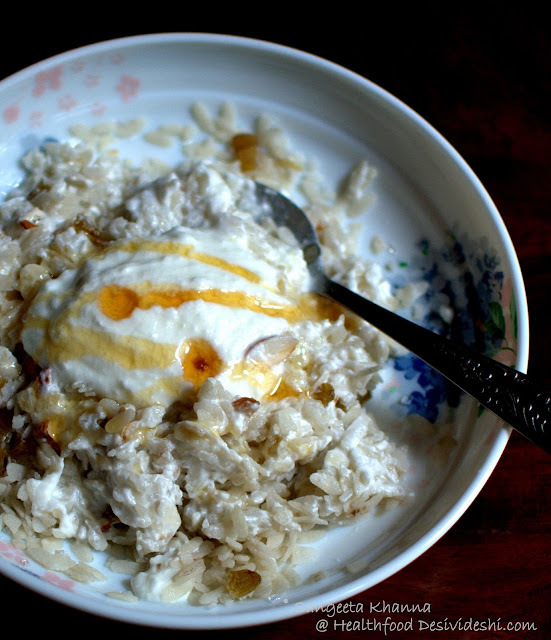 Dahi chiwda is one of those traditional things we can bring into our repertoire or daily breakfasts. 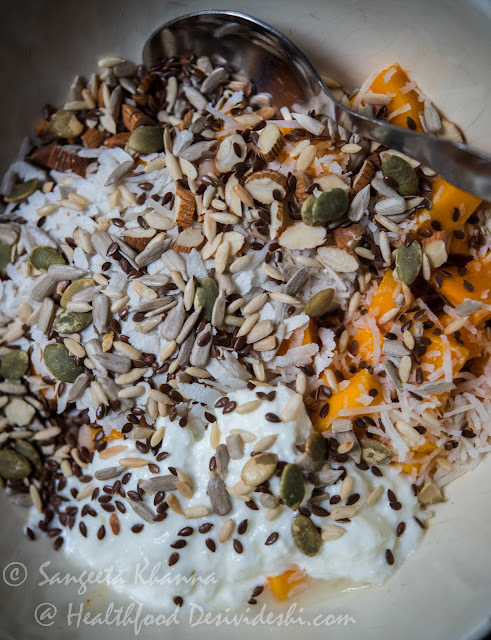 We make this mango poha with added seeds and nuts, some grated coconut too sometimes and that is another way to have a delicious probiotic breakfast. It is an excellent probiotic food as the yogurt, poha and banana or mangoes are all pro and pre biotic in nature. Can it get any better? chiwda dahi (beaten rice with yogurt, fruit and nuts) | a forgotten breakfast from the past..
i love how fresh ingredients look in your picture. Thank you so much Nags. 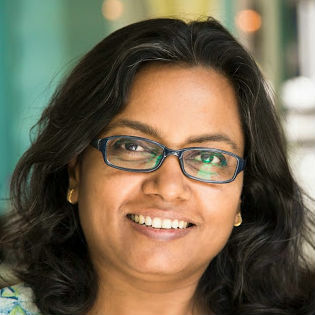 I am so glad you like these Renuka. Hi Sangeeta.Wish u nd ur family Happy MakarSankranti. Just came across this page of yours while finding recipe of DAHI CHIWDA. I liked this recipe as it is easy to make, nutritive because of nuts nd fruits nd above all LIGHT ON WEIGHTwhich is good for those trying to loose weight.Can u suggest some more recipes of this type (easy to make, less time cosuming nd ABOVE ALL HELPFUL IN LOOSING WEIGHT). So glad you liked the recipe suggestions. 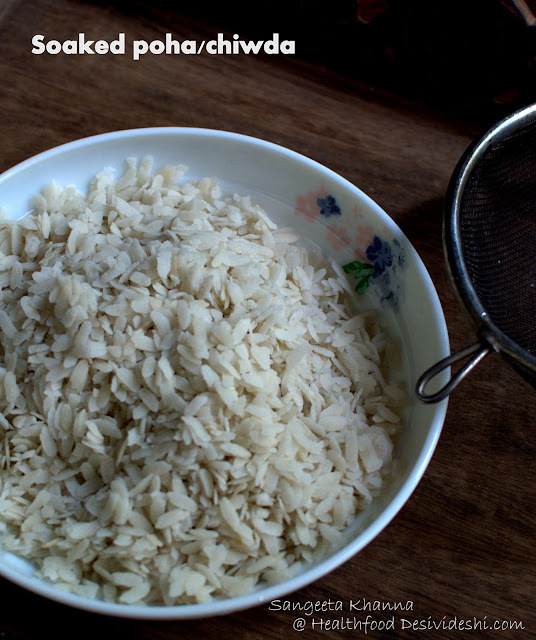 Please check more chiwda or poha recipe on this blog you will get a lot of options. The multi grain poha, the microwave poha, the raw dadpe pohe, the kande pohe, matar paneer poha, poha with mangoes, smoothie with a little poha and lot more options are there on this blog. There are many millet meals too. Hope it will be helpful.